Feeding your dog apple, banana or even pineapple seems like a somewhat normal thing… but eggs. When a friend posed the question to me, ‘Can dogs eat eggs?‘ I must admit, I was a bit shocked. What could possibly be beneficial for dogs to eat eggs? Well… it turns out there’s a lot of great things about our favorite furry friends eating one of the world’s most popular breakfast ingredients. Like a little morsel of goodness, one egg contains a number of vitamins, minerals, and nutrients that can be an incredibly beneficial addition to your dog’s diet. From their richness in protein, calcium, iron and amino acids, to the presence of Vitamin A and B12, two eggs a week can be all your dog needs to maintain a healthy digestive and immune system, and keep their bones and teeth strong. You can even give the egg to your dog raw, making it one of the lowest maintenance and cost efficient snacks for your dog. And no need to waste the shell, that’s just as good for them as the egg’s insides! 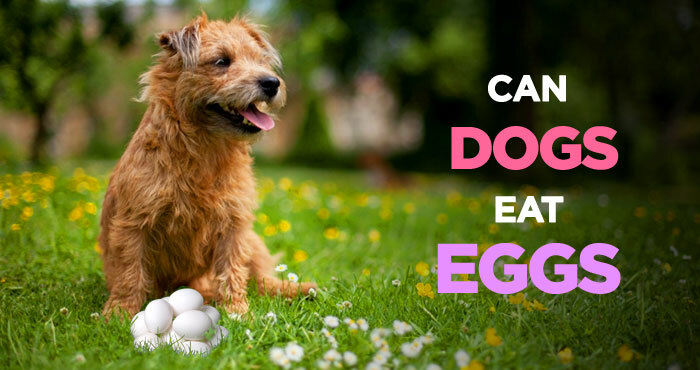 In this article, I explore can dogs eat eggs, why are eggs good for dogs, why pet owners are sometimes hesitant about feeding their dog’s eggs, and how you should feed them to your dog. However, controversial feeding eggs to dogs is, there are quite a few reasons why dogs should eat eggs that everyone does agree on. From the yolk to the egg white, and including the egg shell, it is said that one egg is approximately one whole food source for your dog! That doesn’t mean you start feeding your dog only eggs! What it does mean though is that each part of the egg has its own unique characteristics that make it a nutritional addition to his best dog food. The egg itself is a great source of protein. It can help to build muscle, strengthen hair and repair tissue. 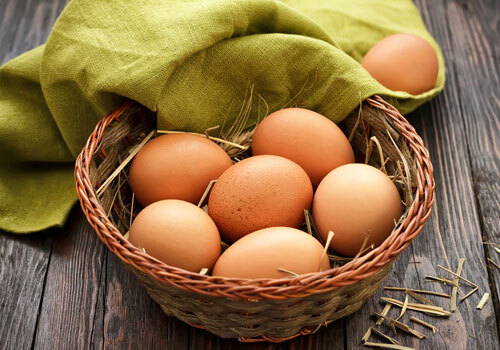 The egg is also rich in amino acids, minerals, Vitamin A, Vitamin B12, iron, can significantly improve the condition of your dog’s skin and coat health, and is an excellent source of Riboflavin and Selenium. Eggs can be a very easily-digested, non-meat protein that can have significant overall health benefits for your pooch. 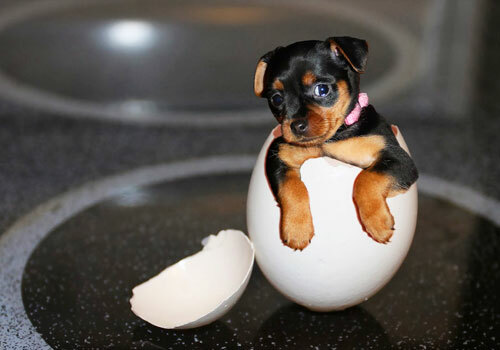 Studies have also suggested that egg shells are a good source of calcium and protein for dogs. By crushing the egg shells using a food processor, coffee grinder, or mortar and pestle, you can sprinkle the eggshell powder over your dog’s usual meal. The nutritional value of egg shells is also supposed to help strengthen your dog’s bones and teeth. A common concern that pet owners express when talking about whether it is good for dogs to eat eggs is that of salmonella or E.coli. With a multitude of information on the internet that is rather confusing and tedious to go through, it is no wonder that many pet owners become concerned. When you think about it though, dogs are animals, canines in fact that are descendants of wild wolves and other types of four-legged species. Although your dog’s make-up is very similar to that of a human, their digestive systems are quite different. When your pooch digests his food, their stomach is so acidic that it actually kills any bacteria. Well, it means that you don’t need to worry about your dog eating a raw egg! If anything, he/she will only benefit from the extra protein and calcium. So bottom line is, can dogs eat eggs? Yes, dogs can eat eggs safely! Are Eggs Bad for Dogs? Just as it is important to know the benefits of your dog eating eggs, it is even more crucial to understand the opposite side of the argument. There is one key argument on the opposing side which many veterinarians and animal professionals do highlight. This is that the egg whites do contain enzyme inhibitors. These inhibitors can interfere with a dog’s digestion, especially if they are only a puppy or are an elderly dog. However, it is important to know that as long as you give your dog eggs in moderation, meaning no more than 2-3 per week, these enzyme inhibitors shouldn’t have much of an effect on your pooch. Some people also suggest boiling the egg before you give it to your dog. This will destroy the enzyme inhibitors but it will also kill a lot of the good bacteria in the egg as well. Another concern that some people raise is about the avidin content in egg whites. Avidin is a Biotin (one of the B vitamins) inhibitor. Biotin is essential for cellular growth, fatty acid metabolism, and to maintain good skin and a healthy fur coat. What a lot of people don’t understand is that egg yolks actually contain excessive amounts of biotin. Therefore, as long as you give your dog the whole egg, yolk, and whites, and only give it to him/her in moderation, your dog will be sure to benefit from all the incredible health and nutritional benefits of eggs. One last concern that I mentioned earlier is that pet owners worry about their dog contracting salmonella or E.coli and potentially passing it on to them or their family. Your dog’s unique digestive system actually breaks down and kills the bacteria that could be present in raw foods, and is therefore, unable to be affected by that bacteria or pass it on. It is recommended that you purchase your eggs from organic, free-range farms. If you can get them from a local farmers market where the eggs are fresh, and the chickens have not been treated with hormones, this is the most ideal product (Organic eggs) to feed your dog. Also storing the eggs properly and in a cool environment will keep the bacteria at a manageable level for your pooch. Although it isn’t a huge concern, you might want to be aware that feeding your dog eggs could result in your furry friend experiencing some gas. If you smell some rather unpleasant scents here and there, don’t worry, it will pass! How to Prepare Eggs for Dog? 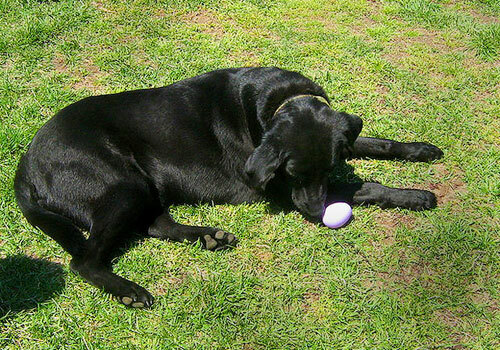 Preparing the egg is rather simple as you are going to be giving the whole thing to your dog. The only reason the preparation methods might change is if you decide to boil the egg instead of giving it to your dog raw. If you decide to boil the egg, cook it for 7-8 minutes or until the egg feels heavy and hard. Rinse the egg under cold water and then proceed to remove the shell. Do not throw the shell away though! Even that part of the egg can be very beneficial for your dog! Once the shell is fully removed, leave it to dry. Make sure that the egg is cooled before giving it to your dog. It is recommended to dice the egg up and give it to your dog in smaller pieces. If you are going to give your dog a raw egg, crack it into a bowl or over your dog’s usual food or kibble. Be sure that no part of the shell has fallen into your dog’s food as the sharpness could be a hazard to the inside of their mouth. Again, put the egg shell aside instead of throwing it away so that it can dry out and be used later. Preparing the egg shell powder requires a little bit of extra effort, but studies suggest that it is all worth it! Once the egg shell has dried out, simply crush it into a soft textured or powdery substance using a coffee grinder, blender, or mortar and pestle. You can crush a few egg shells at a time if you wish and store them in a tightly sealed container or baggy in the refrigerator. Watch the above video. This video shows how to prepare raw eggs for dogs. My Dog Ate Too Many Eggs! What to Do? Dogs are clever little things, and when they get a taste for something, they want it all the time! If your dog manages to get into the carton of eggs and eat a bunch of them at once, it is important not to panic. Eggs are a natural food, so there isn’t too much that can go wrong. If it is a whole egg that your dog has gotten a hold of, the first point of concern is the shell. You want to make sure that there isn’t any shell stuck in your dog’s esophagus. If there is something stuck, you will quite easily be able to tell as your dog will clearly look like they are trying to get something out. You can also make your dog drink some water in order to flush down any small shards that may have been left behind. Other than the concern for the eggshells for dogs, he may experience some stomach discomfort, gas or diarrhea. This will pass once your dog has removed all the egg from his stomach. If after 24 hours, your dog is still showing signs of discomfort, it is recommended that you visit your local veterinarian for an examination. Now it’s a quick question time. I have compiled a list of frequently asked questions about dogs and eggs. After going through these, if you still have any doubt about eggs and dogs then feel free to ask in the comments section below. Can dogs have eggs? Are eggs safe for dogs? 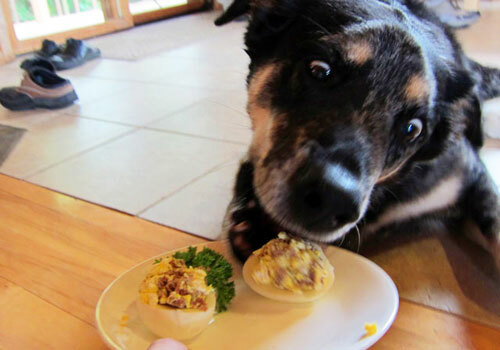 Dogs can eat eggs and, when prepared properly, they are very safe for your dog. In fact, studies suggest that eggs are an incredible source of protein, calcium, iron and various other vitamins and nutrients. Particularly good for your dog’s digestive system, immune system, and for strengthening your dog’s bones and teeth, eggs for dogs can be very beneficial for their general health and wellbeing in a variety of ways. Can dogs eat raw eggs? Are raw eggs good for dogs? 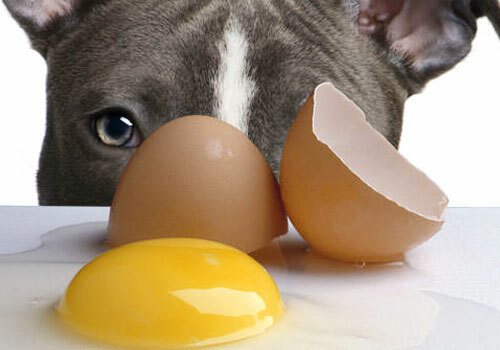 The majority of specialists suggest that raw eggs for dogs are better than cooked ones. This is because, when you cook an egg, it not only kills bacteria but it also kills various vitamins and nutrients as well. Meaning, it is removing the reasons why you are giving the egg to your dog in the first place. If you are giving your dog eggs for their health benefits, fresh, organic, free-range eggs are the most recommended. Can dogs eat egg shells? Can dogs eat egg yolk? Dogs can most certainly eat egg yolk. In fact, giving your dog the entire egg, including the shell will make sure that your favorite furry friend is getting every little ounce of goodness from the egg. You can give your dog the egg white and yolk together, however it is best to prepare the shell a certain way so that it does not become a hazard to your dog. You do this by letting the shell dry and crushing it up using a coffee grinder, mortar, and pestle, or blender, then sprinkling it over your dog’s usual food. How many eggs can a dog eat? Although eggs are good for dogs, it is recommended that you only give it to them in moderation. A dosage of 2-3 eggs per week would be the maximum that I would suggest. This amount will make sure that your dog is getting all the benefits from eating eggs without overdoing it. However, be sure to use your best judgment here. 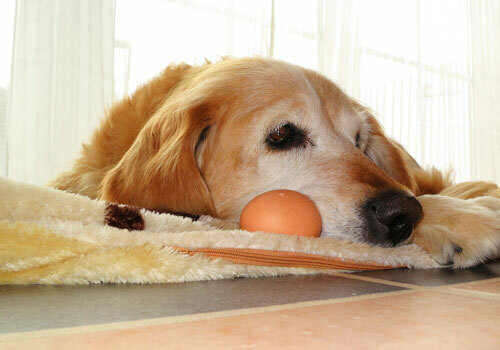 If your dog seems to be uncomfortable or reacting poorly to the eggs, discontinue feeding it to him/her immediately. Can dogs eat hard boiled eggs? Can dogs eat scrambled eggs? 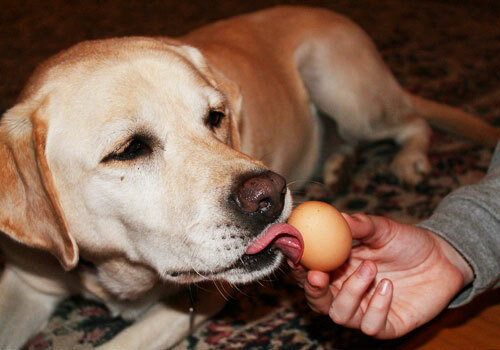 Dogs can eat eggs hard boiled, scrambled or even fried. 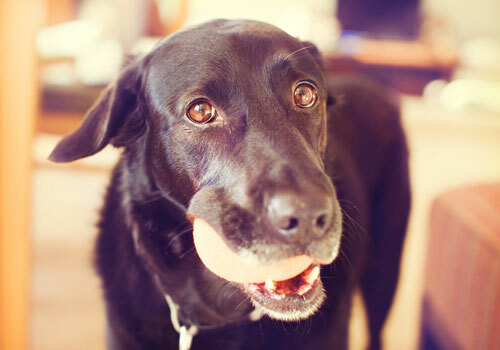 It is recommended that you give your dog raw eggs to make sure that they are getting the full benefits from the food. However, if you still feel uncomfortable giving your pet raw food, I would suggest only feeding them hard boiled, organic, free-range eggs. This is the healthiest alternative. Are dogs allergic to eggs? As with any food, some dogs may be allergic to eggs while others won’t be. If you are feeding your dog eggs for the first time, monitor their behavior over the next 24 hours after they’ve eaten it. If you see that they are uncomfortable, lose their appetite, or are experiencing diarrhea, do not feed your dog egg again. Also, if your dog has a history of allergies and sensitive, it is recommended that you use precaution when giving your pet eggs. Puppies and elderly dogs are slightly different to middle-aged dogs. Puppies especially have rather sensitive stomachs as they have not yet been exposed to various types of food and bacteria. It isn’t recommended that you give eggs to a puppy or an elderly dog as they could experience adverse effects. Let’s summarize… can dogs eat eggs? The answer to this question is, YES, your dog can eat eggs, egg white, yolk and even eggshell. There are enormous benefits in eggshells for dogs. 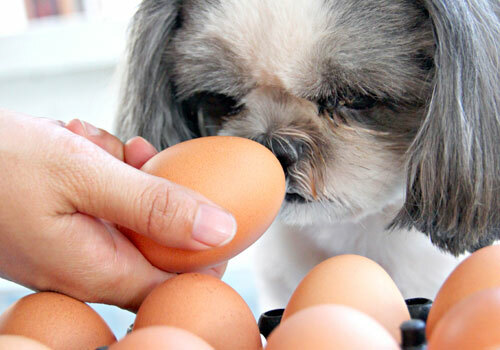 Eggs aren’t necessarily an abnormal, unsafe or bad thing to feed your dog! In fact, you maybe should consider feeding it to you dog! Just make sure, if you do decide to integrate eggs into your dog’s diet, that you take extra precaution when doing so. Although eggs are a natural food, it is best that they are given them in moderation to ensure that your dog is getting only the goodness from the egg, without any side effects. The last thing you want is for your favorite furry friend to be feeling a little under the weather and not their usual self. By removing the egg shell, letting it dry, and crushing it into a fine powder, you will be making sure that your dog is getting every beneficial part of the egg! 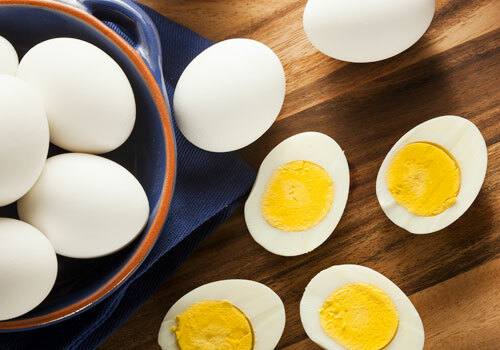 The egg yolk and whites is where all the protein, iron, amino acids, and vitamins are that will positively impact your dog’s digestive and immune system, as well as overall health and wellbeing. The egg shell is full of calcium and will help keep your dog’s bones and teeth strong. Your dog will receive the full benefits of eating eggs if they do so in moderation (no more than 2-3 per week). Eating too many eggs could cause them discomfort and/or diarrhea. Sure enough, with majority dog food and a little tasty, eggy snack, you will have a happy, healthy pooch that will be thanking you with unconditional love and affection! It is worth reading your blog even if it is a bit long. I use boiled egg as an ingredient to my homemade dog food especially made for senior dogs. I love eggs myself, and if there’s something that I’d like to share with my dogs, it is the food that I enjoy. Taking into consideration of the health value, of course. How about cholesterol? Do we need to worry about the cholesterol level if we give egg to furry friend daily? You shouldn’t give eggs to your dog on a daily basis. Feed it in rotation with other treats. An egg every week is perfectly fine.